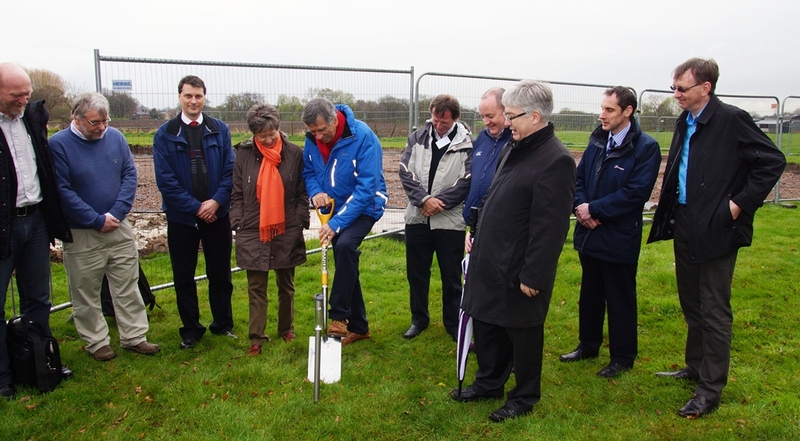 18 April 2012, Manchester, UK – The start of construction of the new headquarters of the SKA Organisation was marked today with a ground breaking ceremony at the University of Manchester’s Jodrell Bank Observatory in Cheshire, UK. Professor Richard Schilizzi, former Director of the SKA Program Development Office, broke the first ground for the new headquarters. Jodrell Bank Observatory was chosen in April 2011 to be the location for the Office of the SKA Organisation. The office, currently located in central Manchester, will move to the new premises later this year.